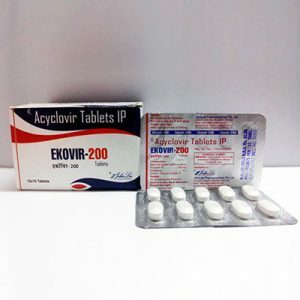 Ekovir-400 mg for external and local use. 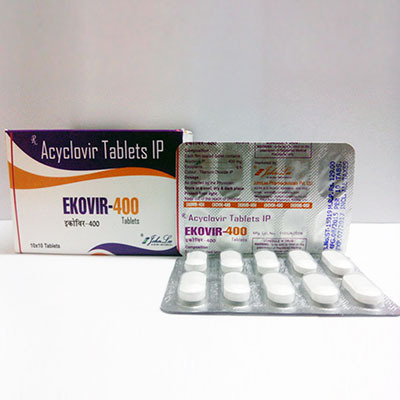 Acyclovir is active against Herpes simplex 1 and 2 types, Varicella zoster virus, Epstein-Barr virus and cytomegalovirus. Thymidine kinase of virus-infected cells through a series of consecutive reactions actively converts acyclovir into mono-, di-, and acyclovir triphosphate. 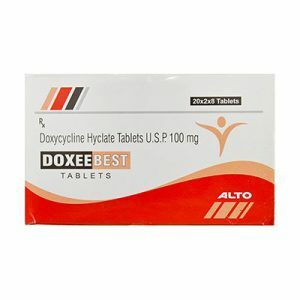 The latter interacts with viral DNA polymerase and is incorporated into DNA, which is synthesized for new viruses. Thus, “defective” viral DNA is formed, which leads to the suppression of the replication of new generations of viruses. The drug is usually well tolerated. On the part of the gastrointestinal tract: in isolated cases – abdominal pain, nausea, vomiting, diarrhea. In the blood: a transient slight increase in the activity of liver enzymes, rarely a slight increase in urea and creatine levels, hyperbilirubinemia, leukopenia, erythropenia. From the side of the central nervous system: rarely – headache, weakness; in some cases, tremor, dizziness, fatigue, drowsiness, hallucinations. Other: rarely – alopecia, fever.